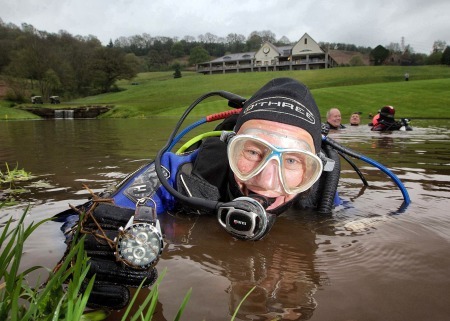 Advanced diver Howard Lewis found the watch and wedding ring on the bottom of the lake in front of the 18th green at Celtic ManorDivers came to the rescue when an Irish golfer lost his watch and wedding ring after watching his golf bag and trolley plunge into a lake on the golf course. Alan Neill was playing the final hole on the iconic Twenty Ten Course at Celtic Manor when disaster struck. Having left his trolley alongside a bunker by the green, he could only watch in horror as the wind blew the trolley down a bank and into the lake. Mr Neill, from County Down, used a bunker rake to fish his golf bag, minus the trolley and several irons, out of the lake. It was only when he was assessing the damage that the five-handicap golfer realised he had left a golf bag pocket containing his valuables open. His mobile phone was soggy yet safe, but a €1,800 watch and his wedding ring were nowhere to be seen and extensive trawling of the bank by Mr Neill and his three golfing buddies failed to find them. “I even stripped down to my boxer shorts and went in looking for them,” said the 39-year-old financial controller. “But it’s a steep bank and the water was very murky. Mr Neill stayed overnight at the five-star hotel, the venue for the 2010 Ryder Cup, and then watched Celtic Manor greenkeepers take over the search in the morning but another two hours trawling the bottom with a fishing net yielded hundreds of golf balls, but nothing else. The hapless golfer then had to head back to work in Gloucester but Celtic Manor had not abandoned all hope. The resort called in Cynon Valley Sub Aqua Club, a group of divers who had performed exercises before in a separate irrigation reservoir for the golf courses. The team accepted the challenge and, after a couple of hours of systematic searching, advanced diver Howard Lewis was able to find the watch and wedding ring with the help of underwater metal-detecting equipment. “I’m over the moon,” said Mr Neill from Donaghadee. “The watch is quite valuable but I was most worried about losing the wedding ring. “Most things are replaceable but a wedding ring is not. We’re celebrating our 10th wedding anniversary in September so it feels great to have the ring back. 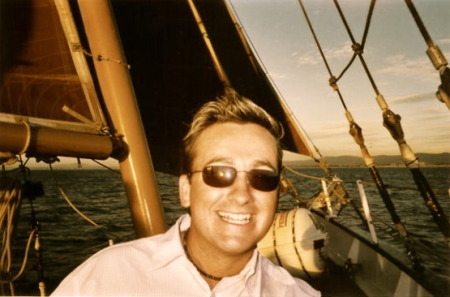 “The watch was still ticking when they found it so my only losses are a seven-iron and a GPS range-finding device, which I retrieved at the time but it has not worked since being in the water. The Irish Open looks set to plummet into oblivion after European Tour bosses took away the event’s financial safety net this week. Adare Manor boss Tom Kane has lost a massive €2.9 million since he took the plunge and signed a three-year deal to host The Irish Open at the Limerick venue two years ago. Graeme McDowell blasted a stunning eight under par 63 to win the Celtic Manor Wales Open by three shots and take a massive step towards returning to the Twenty Ten Course for October’s Ryder Cup. Graeme McDowell would love a good week on the greens at Celtic Manor. Credit: golffile.ieGraeme McDowell is banking on some Welsh wizardry to help break through a mental barrier ahead of his US Open defence. The Ulsterman defends his Welsh Open title at Celtic Manor hoping to rediscover the magical putting touch that sparked the best season of his career into life last term. Graeme McDowell thinks hard on day one of the Saab Wales Open. By day three he had even more food for thought. Credit: golffile.ieGolfers hate the unexpected, whether it be a shank, a socket or a round of 81 out of the blue when challenging for a title on what should be their favourite course on the planet. But that’s exactly what happened to Graeme McDowell in the third round of the Saab Wales Open - a series of blow ups, accidents and meltdowns so bizarre that he admits afterwards that he is asking himself some serious questions about his mental game with less than two weeks to go before he defends the US Open title at Congressional.